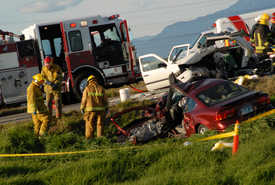 The following are answers to the most common questions our injury lawyer hears from victims of motor vehicle collisions, including auto accidents, motorcycle accidents, bicycle accidents, trucking accidents, and collisions involving drunk driving. Q: How soon do I need to tell my insurance company about the accident? A: You should notify your insurance agent as soon as you can. They may need to process part, or all, of your claim. Do not give any type of recorded statement to your agent or carrier unless we authorize you to do so. Q: Do I speak with the other person’s insurance company? A: Do NOT discuss your case with anyone until you have met with Salt Lake City personal injury attorney Lynn Harris. If the insurance company contacts you for information about the accident, tell them that you have a lawyer and have them contact your attorney's office. This is vital to your case, as the defendant’s insurance company may try to blame the accident on you. Q: Is there anything I should not do? A: Do NOT admit fault for the accident to anyone. This includes the other driver, passengers, relatives, and police officers. The investigating officer may have requested that you sign a citation, but this action was not an admission of guilt. Never disclose how much insurance coverage you carry. The fact that you carry a certain amount of insurance may make you a target for other drivers. Q: Who will pay for my medical treatment and expenses? A: The person who caused the accident and/or their insurance company is ultimately responsible for paying your bills. In the case where the responsible driver is uninsured or underinsured, your own insurance policy may become involved in paying medical expenses and other damages if you carry uninsured / underinsured motorist coverage. You may also be eligible for PIP (personal injury protection) coverage if you pay premium for this coverage or if the driver in the auto in which you were a passenger had this coverage. Q: What happens if the other person has no insurance? A: If your vehicle is insured, you may have uninsured / underinsured motorist coverage. Salt Lake City auto accident attorney Lynn Harris will determine the amount of coverage available and seek compensation from your insurance company to satisfy your claims. Getting your insurance paperwork to us as soon as possible will help to safeguard your rights. Q: What will I get for the property damage to my vehicle? A: You are supposed to be offered the amount necessary to either return your vehicle to its original condition prior to the accident or the fair market value amount of your vehicle if it is damaged beyond repair. Insurance companies use different methods to determine these values and may offer you a lesser amount that you are entitled to. An attorney is prepared to assist you in making sure the amount you are offered is fair under the law. Contact our practice for more information today.